Iron ore provides 30% of the demand for the dry bulk market and, during 2016, its related tonne-mile demand went up by 6%. This was the key factor behind the overall demand side growth of 2.2%. From January to December 2016, Chinese iron ore imports went up by 7.5%. This means that, for the first time, imports (sea and land borne) exceeded 1bn tonnes in a calendar year. In 2016, all other regions except for China imported less iron ore. This increase was influenced by Chinese steel prices, which have been on the rise since June when a tonne was priced at Yuan 2,705 (USD 390). By mid-December, the average price of hot rolled coil in China hit Yuan 4,060 (USD 585) per tonne. This has doubled in the last year, and represents a four-year high. It is due to an increase in demand for steel – coming from construction and from increased public spending on physical infrastructure works. China’s coal import volumes were higher than expected but, as Indonesian exporters grabbed the lion’s share of the demand growth, the dry bulk sector could not reap the full benefit of this upside. This marks a significant change from 2013, when China offered many tonne-miles to the market by importing coal on long haul routes such as the US [read more on this story]. More recently, world coal imports decreased, bringing tonne-mile demand down by 0.6% in 2016. Despite this, there was a slim demand side improvement for the total dry bulk market, due to grains and other minor bulks. Legislative actions by Chinese authorities were the swing factor behind higher coal imports in 2016. Their enforcement of the 276 working days per year policy in mid-April had an immediate effect. This policy was later suspended to secure domestic coal supply for the winter season, causing prices to decline. Freight rates have improved gradually over the year for nearly all segments since the all-time-low we saw back in February 2016. Capesizes were the exception, experiencing a more volatile year as freight rates started to respond to increased demand – as the supply growth rate was no longer sky-high. 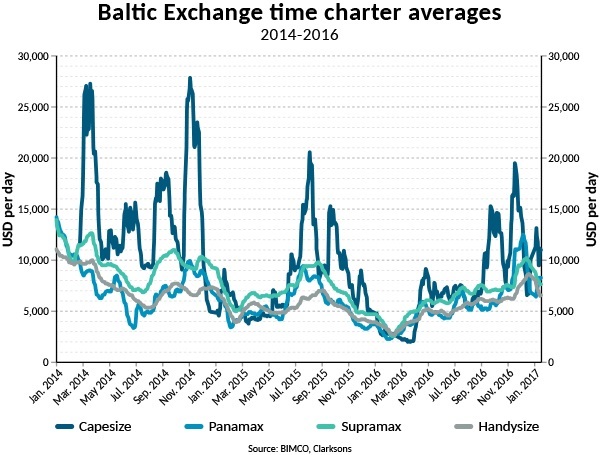 The rise and fall of capesize rates showed their dependency on Brazilian iron ore cargoes. Rates on 25 November stood at USD 15,000 per day – only to sink to USD 6,500 per day three weeks later. As BIMCO expected, Q4-2016 delivered the highest level of demand for dry bulk ships ever. As the supply side grew by 2.25% in 2016 against a slightly weaker growing demand side (2.17%), the most recent data indicates that the market fundamentals worsened. 2016 saw 29 million DWT being scrapped, while 47 million DWT of new capacity was introduced. BIMCO’s forecast for next year is a supply growth rate of 1.6%. This is higher than the zero-supply side growth rate that BIMCO identified as necessary for market recovery in the dry bulk sector in our “road to recovery” analysis last year. It comes on the back of a continued slowdown in demolition interest – which is itself alarming. The work needed on the supply side is substantial and the low level of demolition merely postpones the recovery. 2016 saw the handymax (40,000-65,000 DWT) sector expand the most as it grew by 5%. In contrast, the capesize and panamax sectors had much lower growth. In 2016, the panamax sector almost neutralised its newbuild deliveries with its demolition activity, expanding by just 0.6%. Capesizes grew a little less with a fleet average of 1.9%. In the newbuilding market, two things are worth mentioning. The 31 x 400,000 DWT orders backed by 25-27 years of CoA deals with the Brazilian miner Vale. Of these, 30 were placed by Chinese state-owned interest and one was a Japanese deal. Just 17 ships were ordered by other owners/investors. All of which is unprecedented. 2017 will see more orders being placed. Newbuild prices for dry bulk ships have flattened out since mid-August 2016, but owners and investors may be tempted by low prices to go back to the yards for new ships. Lack of activity from the newbuilding yards has meant the second-hand market has been red hot. According to Vesselsvalue, 648 dry bulk ‘trading sales’ happened in 2016. The panamax segment was the busiest with 154 ships traded, equal to 7% of all panamax dry bulk ships. Average price and age of the traded ships was USD 8.4m and 10.2 years. February saw an all-time low BDI and a record low in second-hand prices. This was an opportunity for those who engage in the asset-play and trusts in a mean-reversion of prices. For example: A linear decline in asset values from a newbuild at USD 25m, with a lifetime of 20 years to a scrap value of USD 3m, implies a 10-year-old ship has a value of USD 14m (the example is to be boxed out on the page). Those buying for trading may also benefit in the longer run as they re-set the cost levels, at least for some parts of their fleet. While those buying for the asset-play at USD 8.4 million may sell it again if prices revert to the mean. The first quarter always has an overall lower level of demand than any fourth quarter due to seasonality. 2016/17 is no different in that respect. Key indicative commodities (according to SSY) in combination, indicate that demand may contract by as much as 5.4%, from Q4-2016 to Q1-2017. But normal seasonality will also play its part, as coarse grain exports out of Argentina, soya exports out of Brazil and wheat out of Australia will go higher in Q1-2017 compared to Q4-2016. Another noticeable seasonality is the fact that January/Q1 always shows a disproportionate amount of newbuilds delivered. During 2013-2016, January deliveries accounted for 17% of the year’s total additional DWT-capacity and Q1 deliveries were 35% of the year’s total. If this is anything to go by, 2017 will see 5.3 million DWT delivered in January and 10.9 million DWT in Q1-2017. China’s five-year plan involving transport connectivity will not only boost the economy in a “traditional” sense by increasing public spending, but also the planned investment into physical infrastructure improves the forecast for dry bulk imports. In support of the One-Belt, One-Road (OBOR) initiative, USD 259 billion is set to be spent on highway and waterway projects in 2017. Moreover, as China expands its railway system in 2017-2020, plans to spend USD 503 billion on infrastructure investments also supports both OBOR and dry bulk shipping. As in past years, China’s investments in housing and connectivity is critical for the dry bulk shipping sector as the rest of the world isn’t growing its dry bulk imports. Usually, by 15 March 2017 the Chinese winter heating period is at an end. During this period, Chinese coal mines benefit from an extension to the official national limit on the number of working days they can operate (from 276 to 330 days). This is to allow them to increase domestic production and thereby ‘control’ the coal price during peak demand seasons. The end of this extension during March may benefit dry bulk shipping if domestic demand for coal exceeds domestic supply while coal prices do not increase significantly as they did in the run from April to the start of the winter heating period. For the coming months January-April, BIMCO expects supply to outstrip demand and a level of loss-making freight rates will follow in its wake. BIMCO will provide more details on the “road to recovery” for the dry bulk shipping industry, with a new status update in February 2017.